Why do people use Tobacco? Peer pressure- This seems to be one of the first reasons that kids especially start using tobacco. They usually first get it from a friend (or parent!) who urges them to try it and be like the “big kids”. By the time the child goes to the store to try to purchase tobacco, many might have already been using it for several days or even weeks. Some of these kids say they need to display the “ring on their rear” in order to be accepted with some of their peers. In others, the circle on the back pocket is a coming-of-age or emancipation symbol, marking the passage to adulthood and “independent thinking”. Social pressure and Association- Being in an environment that condones tobacco use (sports, bars, outings or any place they are around others who use it) can be a great motivator. Users are often able to quit for a significant length of time but begin again when they’re around others who dip or smoke. Behavior- Some chewers have been “dipping” so long that they miss the ritual of opening the chew can, getting the “dip” and putting it in their mouth. The most common statement heard from these users is “I just miss something in my mouth” (i.e. oral gratification). Here they have a choice of either quitting “cold turkey” and dealing with the loss of the behavior or using an oral alternative while they cut down. Mint Snuff products are great for these people because it allows them to yield to the cravings of the behavior yet do so with a harmless product. Nicotine Addiction- There is a significant amount of nicotine in smokeless tobacco. Although many young users might not be addicted yet others get that way rather quickly. You might ask a user how long they have been using smokeless tobacco and how many cans a week they use to get an idea of possible levels of addiction (the range is one to three cans per week). Many of the questions asked of smokers apply to chewers to determine addiction levels. Many health professionals use the nicotine patch or nicotine pills with non-tobacco chew to help their nicotine-dependant patients. Salt Cravings- A typical can of smokeless tobacco contains over 1100 mg of salt. Some people not only suffer from nicotine withdrawal but also from salt cravings once they have quit using smokeless tobacco. These cravings might be confused with nicotine withdrawal. 1. Education- One of the easiest and first lines of defense in cessation is to educate them on the dangers of tobacco. Give your patients literature from the American Cancer Society and the National Cancer Institute. We have some pamphlet and booklet suggestions in this web site. Posters, pamphlets and repeated reminders (i.e. intervention) from health professionals to their patients to not start using tobacco can be very influential. Encouraging and educating young people regarding non-tobacco use can also help that person become influential to their peers. 2. Quitting “Cold turkey”- People can and do quit chewing on their own. The health professional can be very helpful by encouraging quitting and giving support whenever possible. Chewers who have not been chewing very long are often successful with this method. 3. Chewing an alternative- Oral gratification “missing having something in my mouth”, behavioral rituals and peer pressure are powerful influences to keep a person using smokeless tobacco. Here is where using healthy alternatives like Mint Snuff All Mint Chew or Pouches becomes so valuable. They allow the patient to continue the behavior and yield to whatever pressures keep them chewing but without the danger of tobacco. Some people can quit the behavior altogether after a few weeks, others take longer. If they quit and then feel the need to relapse, they can once again use Mint Snuff until the urge passes. 4. Titration- Some chewers who have strong nicotine withdrawal find it helpful to mix Mint Snuff with their tobacco. Some mix it with tobacco in a ratio of 1:4 one week, 1:3 the following week, 1:2 the next, 1:1 afterwards and finally to straight Mint Snuff. Click here to see Dr. Dan Laizure’s method. 5. Alternating dips- Use tobacco and Mint Snuff alternately starting every other dip then gradually using Mint Snuff more and more until they don’t use tobacco anymore. 6. Use of nicotine patches- For those chewers who display definite signs of nicotine withdrawal, doctors may consider the use of nicotine patches. Please check the latest information on suggested levels and age criteria for the use of patches with smokeless tobacco users. 7. Nicotine gum (Nicorette)- Studies have suggested that nicotine gum has not been very helpful in the cessation efforts. However, it is always worth a try if the patient wants to try it. 8. A prescription of wellbutrin (also called Zyban, a prescription anti-depressant pill) and the use of Mint Snuff Chew or Mint Snuff Pouches. A few un-named professional baseball players quit using this method. “No, I don’t use tobacco”- Your response- “Wonderful, and I don’t ever want you to begin..” Some have expanded this opportunity to ask if they know about the dangers of chewing tobacco so they might be able to tell one of their friends that does use tobacco. Ask if they would like to take some brochures on tobacco cessation to a friend. By intervening now, and letting them know how you feel about tobacco use, they can begin creating an anti-tobacco attitude before they are offered tobacco from a peer or another adult! “Yes, I have (or do) use chewing tobacco” – It can happen! The best you can do now is to find out how much they are using, why and then tell them briefly about the dangers of tobacco and that they should think about making their own decision to quit. There are no good reasons for them to be chewing tobacco.Offer them information about the dangers of tobacco and try to find out why they chew. Kids from about 14yrs to 21 yrs- Sometimes this is the toughest group to get to but represent the majority of new users. Asking if they would like to quit and then giving them information about the dangers of tobacco use are a great way to begin. If it is obvious that they are probably going to continue “dipping” anyway, you might want to suggest they do so with a healthy and harmless product like Mint Snuff and offer them a sample can. People 21 yrs and older- Many of the chewers in this age group have been chewing for many years. However, they may have also read about the dangers of chewing and/or have had their girlfriends or wives urge them to quit. For whatever reason, the health professional can again ascertain their desire to quit and offer an alternative if they need one. These people may need extra help with nicotine withdrawal. Find out if the patient is ready to quit- If the patient uses tobacco, tell them of your concern that they quit and ask them, “Do you want to quit?” If the answer is YES, continue with the cessation program. If their answer is NO, state “When you want to quit, let me know and we can help,” then go on with your normal procedures. Don’t badger, just let them know that you care and you can help. Cessation experts report that unless a person is ready to quit, your chances of helping them is very low. Offer help- If your patient uses smokeless tobacco, ask them why they chew, and if they would be able to quit “cold turkey.” Ascertain whether or not they chew for social and/or behavioral reasons (i.e. “other guys do it…,” “only during baseball..,” “I need something in my mouth..,” etc.) If they feel like they want to continue chewing but need help with their behavior by using an alternative, offer Mint Snuff™ All Mint Chew™ or All Mint Pouches™. Where Can You Send Patients to Buy Mint Snuff? Mint Snuff Chew™ and Mint Pouches™ are usually found in the tobacco section at grocery and convenience stores. Many Krogers and Kmarts now carry Mint Snuff Chew and Mint Snuff Pouches. Please ask your favorite store to carry it for you or your patients. For a store near you click here or call 1.800.EAT.MINT * 1.800.328.6468 8:30a-5:30p Pacific Time Mon.-Fri. If your clinic would like to have a limited number of complimentary samples of Mint Snuff™ products, informational brochures, or tobacco education posters please e-mail your request to us. Please include your street address, UPS cannot deliver to a post office box. This offer is limited to health professionals. 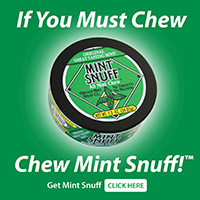 If you are a consumer looking for samples from a local dentist, please email kim@mintsnuff.com We are in the process of building a national database of dentists and hygienists that stock Mint Snuff Chew and Pouches for their patients.